Dept. of Bus Benches: Check out this thread. I literally can’t think of much use for a bus bench other than…a bus bench. The new stadium for the Rams and Chargers will be about 1.5 miles from the Crenshaw/LAX Line station that will serve downtown Inglewood (at Florence and La Brea). The challenge: finding the $600 million or so for the people mover. One idea the city of Inglewood is mulling: a property tax increment financing district, in which increases in property taxes help finance the project. The city is also looking at public-private partnerships as a possibility. The stadium will host 20 regular season NFL games, the 2022 Super Bowl and the opening and closing ceremonies of the 2028 Summer Olympics, as well as some soccer games (and other events). The 2026 World Cup will also include games in the L.A. area although the venue hasn’t been selected yet. 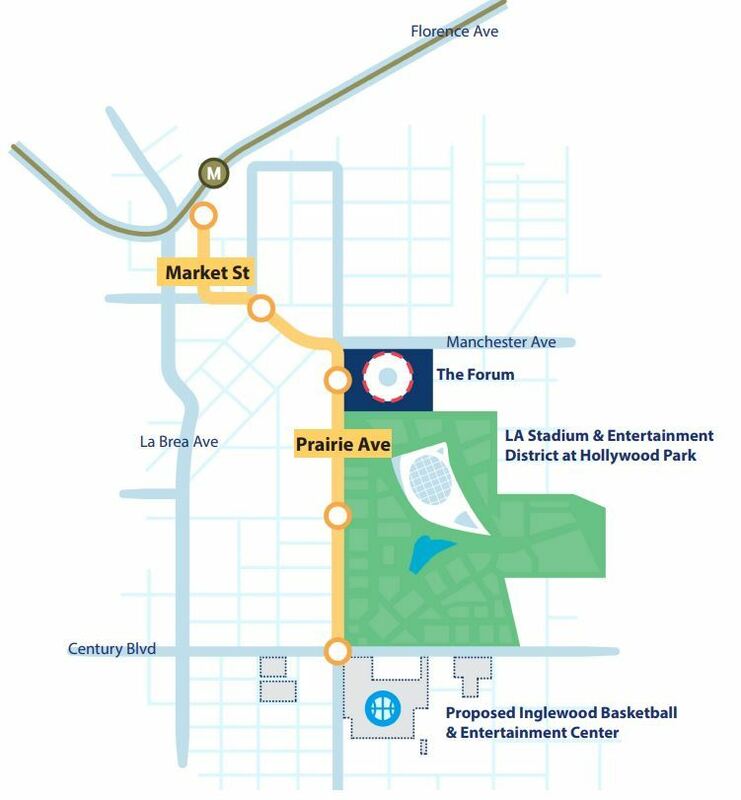 Bold prediction: a reader will ask why the Crenshaw/LAX Line wasn’t planned to go closer to the stadium. Short answer: the project was approved by the Federal Transit Administration in Dec. 2011 and heavy construction began in 2014 whereas the deal to build the new stadium and relocate the Rams to L.A. didn’t happen until 2016 with several stadium sites under consideration in the years prior. Excellent post and video that looks at an issue we have frequently heard about over the years: the stretch of the Expo Line between Vermont and 7th/Metro, including the junction with the Blue Line at Washington and Flower. The challenges: trains run at street level, trains are running every three minutes during peak hours and trains must contend with some extremely busy intersections. Metro staff last summer gave the Board some early concepts on improving the Blue/Expo junction, as well as separating sections of both lines from the street either via tunnels or bridges. Very intriguing but it must be noted that these are improvements that would cost hundreds of millions of dollars and funding would need to be secured before anything could happen. On a related note, the issue of traffic signal priority burped forth on Twitter this week. Metro and the city have been working together on this issue for some time and some short-term improvements are in the works. The same issues are relevant on other Metro lines, including the Orange Line busway (where railroad-style crossing gates are being studied, as well as a pair of bridges over busy streets) and parts of the Gold Line. The way it has been explained to us is that the traffic signals are timed to the train schedule, i.e. if trains arrive at intersections on schedule, they should get a green. It's not an automatic green every time the train reaches an intersection. The city of Pasadena may ask voters in November to consider a sales tax increase that officials say is necessary to maintain essential city services and infrastructure. What makes this article relevant here: the Pasadena mayor points out that much of the sales taxes already collected in the city are going elsewhere — including two cents on the dollar to Metro via the agency’s four sales tax measures (Prop A in 1980, Prop C in 1990, Measure R in 2008 and Measure M in 2016). The issue for Pasadena: only a portion of those funds are directly returned to the city. That is correct — and I think it’s important to emphasize that’s also by design. A portion of the Metro sales taxes are returned to cities and unincorporated areas on a per capita basis for local transportation projects. The remainder of the funds are used to build, operate and maintain a regional mobility system that includes roads, transit and walking/biking projects and programs. Example: the $2.8-billion, 31-mile Gold Line, which includes six stations in Pasadena. The vast majority of that was paid for by Metro (via funds collected from across L.A. County), not the city of Pasadena, and I think it’s fair to say that Pasadena has benefited from that regional investment. Dept. of Dodger Stadium Express: Mark my words, the Dodgers will face the surging Cincinnati Reds in the 2019 playoffs. Can’t wait. In the meantime, you can take the bus from Union Station and the Harbor Transitway to see the Dodgers en route to another NL West title this year. More here. I’m sure the property tax increase will not be popular among locals, who I doubt will use the connector often at all. And if Metro is mulling reducing bus service in Inglewood once Crenshaw/LAX is operational, it’s an even worse idea. This project is a joke, and the City needs to stop. You cite Pasadena pay taxes to fund light rail and have benefited from the Gold Line. Here in West Hollywood we also are paying taxes to fund light rail yet no ight rail. What we have is one the heaviest traveled transit corridor on both Sunset Bl. and Santa Monica Bl. that are grid locked during the AM and PM rush hours. The Westside including Century City were developed with the promise of the extension of the Glendale Freeway from it’s current terminus, connecting with the Hollywood Freeway at Vermont Ave. where space was provided when it was built in the late 1940’s/ early 1950’s. Governor Brown cancelled the freeway during his prior reign with no replacement provided. It’s time a replacement is provided ASAP. The gridlock is not going away and is only getting worse everyday with the surge we are seeing in our economy. I can walk from Santa Monica and Olive Dr. to MTA Division 7 quicker than an auto or bus in the morning or evening. What we are seeing is totally unacceptable. This problem is not isolated within West Hollywood but instead extends westbound thru Beverly Hills, West Los Angeles and Santa Monica and eastbound it extends thru Hollywood, Silverlake and Echo Park. It’s time the MTA addresses the issue where those in Los Angeles County constituents travel instead of where it’s the most politically correct. As a former RTD/MTA Road supervisor I can attest to the fact that Crenshaw Bl. is far from being as heavily traveled than the above transit corridor or many other corridors yet a light rail line is being built that does not even interconnect with the Expo Line as it should have. Now we see another line proposed apparently to fix the political problem with the alignment of the Blue Line. So this line as proposed will operate on parallel tracks then run south approximately one mile to the east. Although the Blue Line alignment was a good choice following the old Pacific Electric right of way to Long Beach it was ill conceived by the former LACTC choice of equipment and non standard rail gauge. Some twenty plus years later we are still plagued by the MTA’s inexperience in planing and operating rail and bus lines. I have brought up this issue with my County Supervisor only to receive no answer. It’s time for the MTA to act and not ignore such a serious problem. Perhaps a alternative would be for a rival agency or private entity to build a light rail line following the old Pacific Electric right of way granted by the federal government for which the granted land can not be converted to other uses without reimbursement at the current land value. Why not add special OptiCom Receivers for rail priority along Flower Street? If there was money available, I would hope they would consider using the people mover to bridge the gap between the Crenshaw/LAX line and the Green Line. Just continue down Prairie Ave. and make the slight westwardly turn to meet up with the Hawthorne / Lennox Station on the Green Line. That would allow users from the Gateway cities (and later on, the WSAB line) to access the stadium via Metro instead of having to circle around to Downtown Inglewood. Also, after events, you would have spectators going both directions on the people mover instead of one way, reducing the “rush hour” effect that will happen before and after the events. 1.5 miles is actually walking distance from the Crenshaw line station to the Forum. What they should do instead of spending $600 million for a people mover that will hardly get any use at any other time than game day or concert is add elevated moving walkways. I suspect most visitors won’t be using Metro. Most will drive since they are coming from all areas of LA. Pasadena has seen land value shoot up as a result of the Gold Line, but this doesn’t bring any money to keep the city running. Once again, a reminder that the entire region has ignored “value capture” as a financing method. Value capture built the transit system of Singapore, of course. But it also built the very American trans-continental railroad. By ignoring it, we have socialized the expense of the system and privatized the wealth it generates. Steve, a personal question: Is there anyway to request a power washing at a bus stop? Mine at La Brea/Coliseum is absolutely gross. Bus benches/shelters are managed by Outfront Decaux and the city. They’re pretty responsive on social media, or you can use the LA 311 app to request service. I really don’t see why the people building the stadium wont build it themselves as they are the ones who will directly benefit from it. That people-mover probably won’t get build, and the end result would be a shuttle service similar to the dodger stadium express picking people up from the Crenshaw, LAX/La Brea, and possibly Expo/La Brea stations (yup), or a BRT Line from Crenshaw Green Line and Expo/La Brea at best. Outside of events on the Forum and the Stadium, why exactly would people NEED to use this? Not connecting to the green line already makes this a half-baked project, but hey why not go with the trend huh? Or you could run a spur line off the Crenshaw line down the east side of Prairie and run special game-day trains. Remove the unused sidewalk and just put tracks on the the northbound #3 lane. Non-game days and non-event days just open the lane to traffic. Only one grade crossing at Manchester between Florence and stadium. Cost: $20 million – mostly for interchange at Florence and grade crossing/signal optimization at Manchester. Cost to repave one lane of Prarie for one mile with train tracks embedded is negligible. No utility relocation, only one pedestrian crossing, no change of trains, and no negative effects on neighbors since the lane would go back to normal on non-event days. Check Page 21-22 of the feasibility study for info on why the city opted out in an interlined underground LRT along Prairie to the Stadium Entertainment District. I still believe your ideas for at-grade, event-based service have some merit! Regarding Blue/Expo vs. auto traffic on Flower Street: its not cars that cause the problems for the light rail lines, it’s the policy of providing preferential treatment to cars over trains. Why not allocate green time in proportion to the number of people carried by each mode? That sounds fair, doesn’t it? The light rail lines currently use approximately 33 percent of the green time in the peak periods (assuming 40 trains per hour, 30 seconds per train, and no overlap) and 17 percent of the green time during the mid-day. By comparison, the Blue and Expo Lines combine to serve approximately 65,000 daily trips through this segment of their alignments, as compared to approximately 35,000 people per day on Washington Boulevard (and far fewer people on other streets, such as Venice and Pico). Under the proposed policy, the light rail lines would be entitled to at least 65 percent of the green time, at least twice as much as they are currently using. The real answer is what should have been done in the first place — full grade separation on Flower. Budgets were tight, but this could have been accomplished when the Expo Line was constructed. Motorists should not be penalized for poor planning on Metro’s part. Cars and mass transit must live together – not compete. Easiest fix to the train congestion at Washington/Flower: close down Washington Blvd between Flower and Grand. Both rail lines would benefit (no more interaction with cars), and Flower Street drivers would benefit (fewer red lights). And LATTC would gain an expanded footprint, with a direct pedestrian connection to the Blue Line. Yes, east-west traffic on Washington Blvd would have to be rerouted somehow. I can live with that. Hi, I don’t know if it is just me at the South Pasadena Station TVM’s. Now it is the 3rd day the TVM’s cannot be used (as of this morning). Are the rail station TVM’s all offline? Thanks. TAP is experiencing system issues that intermittently impact various stations. Staff is working to troubleshoot and restore system.